Native of the valley, Georges Hottegindre belongs to the 5th generation of a family of cable car and ski lift constructors, mountain guides, hotel and restaurant owners since 1928, on Bellevue and Prarion mountains, one of the ski areas of Chamonix valley - France. 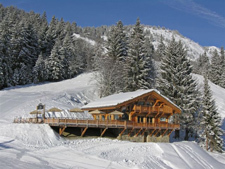 Georges was a former official trainer of the French National Ski Team,with this background, what more natural than to build a mountain restaurant. So, a few years ago, Georges built this altitude restaurant in the strict respect of our mountain building ethics and traditional architecture, which means a construction of wood and stone. The restaurant is located very close to the world renowned Kandahar World Cup Downhill Competition. No need to tell this magic spot became right away the "must", the inevitable meeting point for skiers, snowboarders and snow shoe trekkers. Its subtle decoration is an invitation to relax during your skiing day. Since summer 2009, a hand painted stone orientation table, enriches the amenities you will find at "Le Hors Pistes Restaurant". The welcoming atmosphere and the great "Menu" will add to the thrill of the architectural beauty and harmony of the restaurant and its superb surroundings.